Salmonella, the causative agent of Typhoid / Enteric fever is a leading cause of food poisoning and related illnesses. According to the Centers for Disease Control and Prevention, about 40,000 Salmonella infections occur in the United States each yeare. Even the sword of Alexander the great and poetic words of Rudyard Kipling were put to rest by its infection. While Man wants to explore the universe to get mightier, it has been recently found that, when deadliest pathogen like Salmonella is let to explore the space….. It gets a chance to get even mightier than man. 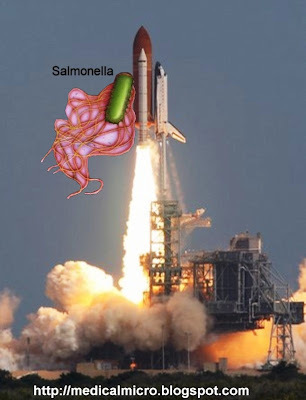 The Salmonella experiments were flown on shuttle missions to the International Space Station (ISS) in September 2006 and March 2008. The 2006 results showed that the space environment causes a short-term alteration in Salmonella virulence - the bacteria cultured in space were more virulent than those on Earth. The 2008 experiment confirmed the 2006 results and demonstrated that a change in the growth environment of the bacteria controls its virulence. According to the results of the experiment, Salmonella that has spent a few days in space is far more deadly than plain earth-bound salmonella. Salmonella become super-virulent in space, according to a study of salmonella that spent 12 days orbiting the Earth on the space shuttle Atlantis. Astronauts aboard the space shuttle grew the salmonella, and back on Earth researchers used it to infect a group of mice. For comparison, bacteria grown in a laboratory on Earth in normal gravity infected another group of mice. The mice infected with the space-grown germs had a mortality rate almost three times higher than that of mice given germs grown in normal gravity. The authors discovered that 167 genes were expressed differentially between the space- and ground-grown samples. They also found evidence that a regulatory protein called Hfq, which regulates messenger RNA translation in response to stress and can alter Salmonella virulence, likely plays a major role in Salmonella’s responses to the space-flight environment. The flight cultures showed significantly reduced levels of Hfq expression. Since spaceflight involves a number of environmental changes we do not know the exact part of spaceflight that caused the change in virulence. The space experiments helped researchers show that a mechanical force known as fluid shear, the motion of fluid that cells sense as fluid passes over their surface, could have a dramatic effect on Salmonellas disease-causing potential. Lower fluid shear conditions, it turns out, are found both in microgravity and in our intestines.